Soft felt hat with a wide brim, as seen on everyone from Bogart to Bond. My personal favourite. 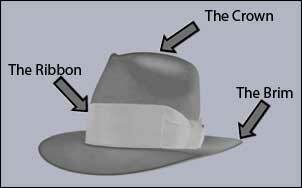 Stiff felt hat with a single centre dent in the crown and a brim fixed in a tight upwards curl.